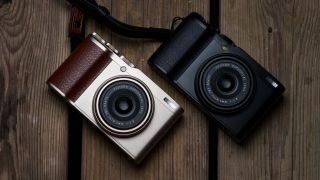 Fujifilm has announced the XF10, the company's new pocket-sized premium compact camera, which replaces the X70. The Fujifilm XF10 features a 24.2MP APS-C sensor (with the more standard bayer array, as opposed to the X-Trans design featured in higher-end X Series cameras like the X100F). This sees the XF10 support an expanded ISO range from 100-51,200, while 4K video capture is at a pretty modest 15p. Like the X70, the XF10 features a fixed 18.5mm f/2.8 Fujinon wide-angle lens that's equivalent to 28mm in 35mm format. There's also a Digital Teleconverter function on the XF10 that gives users the option of taking photos with equivalent focal lengths of 35mm and 50mm, although this will compromise image quality. The XF10 has a 3.0-inch touchscreen, but there's no built-in electronic viewfinder. If you're addicted to Instagram and its square format then the XF10 could be for you thanks to its Square Mode, which enbables you to switch to 1:1 aspect ratio format with a single flick on the touchscreen. The XF10 also offers 11 Film Simulation Modes and 19 Advanced Filters, including two new ones: Rich & Fine, which renders brighter and more vivid color at the centre of the frame with slight shadows at the corners, to emphasize the subject; and Monochrome [NIR], which simulates infrared shots. The Fujifilm XF10 will be available in August 2018 in a choice of black and champagne gold finishes, priced at £449 / $499.95 / AU$799.